The might warriors circle each other warily, keen eyes searching for the slightest chink in their foe's armor. The tightness of an overtaxed muscle. The telltale twitching of an over-eager sword arm. An over-reliance on purple gems. We've a great fondness for the work of video game humor site Dorkly here at Kotaku. I've featured their work here so often that folks often ask me if we have some sort of official agreement. The answer is no, not particularly, but I'd like to think they were aware enough of my plans to feature their videos on a weekly basis as part of Kotaku Off-Kilter that they featured one of my favorite games of all-time in today's video. 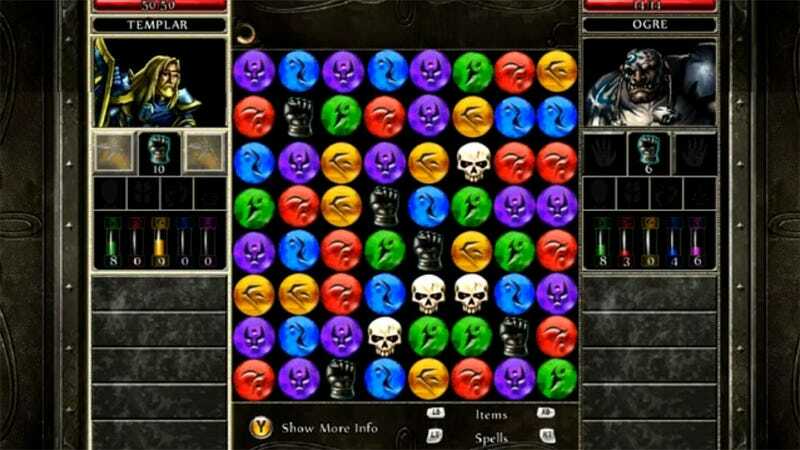 I've played Puzzle Quests one and two on every platform imaginable. I've currently got ongoing campaigns in the second game running on my iPad, my Xbox 360, and my Kindle Fire, all at once. So while yes, it is a little geeky, it's my kind of geeky. Speaking of which, if you notice what's wrong with the gameplay in the video you will win my respect. Nothing else, just the respect. I hear it tastes like cinnamon.